Posted by Geraldo Neto in Qualidade de Vida, Sinais e Sintomas, Stress. There are numerous emotional and physical disorders that have been linked to stress including depression, anxiety, heart attacks, stroke, hypertension, immune system disturbances that increase susceptibility to infections, a host of viral linked disorders ranging from the common cold and herpes to AIDS and certain cancers, as well as autoimmune diseases like rheumatoid arthritis and multiple sclerosis. In addition stress can have direct effects on the skin (rashes, hives, atopic dermatitis, the gastrointestinal system (GERD, peptic ulcer, irritable bowel syndrome, ulcerative colitis) and can contribute to insomnia and degenerative neurological disorders like Parkinson’s disease. 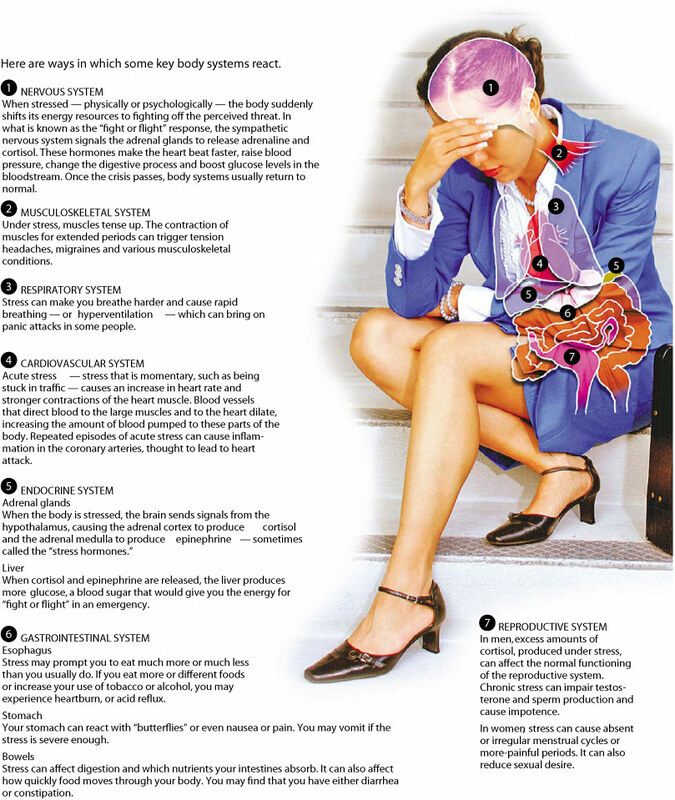 In fact, it’s hard to think of any disease in which stress cannot play an aggravating role or any part of the body that is not affected (see stress effects on the body stress diagram) or. This list will undoubtedly grow as the extensive ramifications of stress are increasingly being appreciated. As demonstrated in the above list, stress can have wide ranging effects on emotions, mood and behavior. Equally important but often less appreciated are effects on various systems, organs and tissues all over the body, as illustrated by the following diagram.